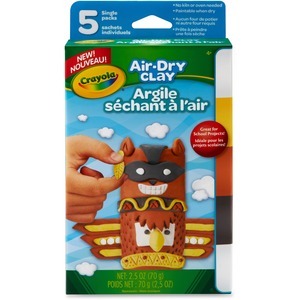 Ideal for crafts and school projects, Air-dry Clay is a fine, natural earth clay that hardens from wet clay to a hard solid without firing or baking in oven or kiln. Clay is easy to mold and sculpt. It takes two to three days to harden. Clay comes in foil packs and in a variety of colors: white, charcoal, terra cotta and Sunglow.